Friday afternoon and I’m alone at home. The daylight is almost gone; the landscape is full of different hues of blues and greys. The temperature is two degrees below freezing point. I just lit a candle and am preparing myself for the weekend. The dinner is in the oven. The dress in done. It was giving me nightmares and there were times when I thought that I should throw it away and march with the child to a store but she tried it on last night and was doing cancan steps with it and tossing the skirt’s hem from side to side and she was quite happy. I did some shortcuts of which I’m not proud. And the workmanship… we won’t talk about it. The shawl is still on the needles but if I won’t make it in time, I have another blue shawl that she can wear. While I have been busy with the dress I have not paid too much attention to the man in the house (I’m not talking about the Cat). I’m a light sleeper and woke up in the wee hours because I was sure I heard my husband talk to me. He was not talking but he was thinking very loudly. He is obsessed. (You know what they say about men getting sick, well, guess what could be said about men being obsessed...) About this time of the year this very same obsession hits him hard and I start seeing lots of magazines and adds around the house. Those adds spread like leaves in the fall. Words like ArcticCat or ForestFox or Switchback seem to be the only topics he ever talks about. I have to give my opinion of things I don’t understand too much (I will gladly put my input when we are discussing whether it sould be blue or red). Or sometimes it is enough if I just listen. Last night I was knitting the Casino Shawl. When I sat down I looked at the time, it was almost ten. Around mid night I put the shawl down and I’m sure I just said good night few times to the girls and yes and no in the appropriate places and was more or less just listening for this endless list of the bad and the good. He is wishing for me to grow up a similar passion, I know that if that were to happen in a blink of an eye I would have my own if I wanted to. I’m talking about snowmobiles. There is no snow at the moment so now is the time to dream of the long and adventurous safaris all the way up to the Arctic Ocean with a new snowmobile that has qualities that I did not know existed. I’m almost certain that I have never ever heard anybody talk of a new spinning wheel or new yarn with the same kind of glorification. Nor could I picture myself singing praise to any yarn to my husband for two hours in a row. Maybe I should because I have something in my stash that I could describe with the words the best there is. I’m glad that the dress is done and I’m free to dream of my knitting adventures. It is December; I’m planning on taking this month this year in a very relaxed way. There will be no panicking with Christmas preparations and cooking and baking will be small scale only. I will make the gingerbread house but I don’t promise to make anything else. Instead I will knit and lit candles. And will go and see Snow Queen for a few times more. The premiere night was beautiful and I was so proud of my girl and I could see more passion and dedication there. And dreams come true and those that are only dreams at the moment. We have had two small power failures today. But really they don’t bother me that much any more. Because I’m prepared. In the evenings my husband finds it hard to fall asleep when I have the light on for reading. So at some point he will kindly ask me to turn off the light. He does not know that I have these needles. I imagine that from now on the phrase will be something like, would you please turn off the needles…. I have not enjoyed being away from the blogland. I have missed you all. And you have been missed, so glad to see your new post this morning. Here too we are into the blue/gray half days. No snow as yet, today is freezing rain, snow for tomorrow. 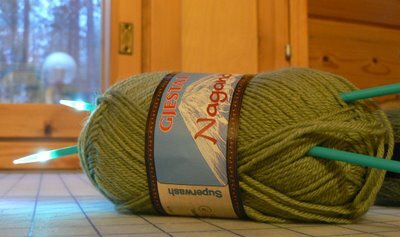 I am so delighted for you that you have the Musk Ox yarn to knit. I receive a tiny skein, just enough for a book mark, but what a joy! 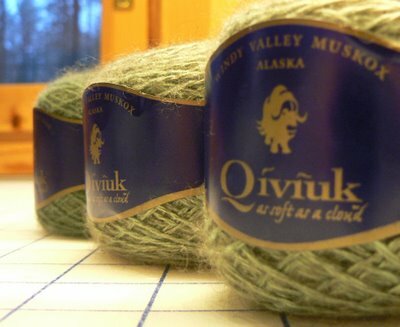 What ever you knit with the Qiviuk will keep you snug even on a snowmobile. I've seen and read on the site of Snow Queen, luckily there's and english version...It must be so sweet to be there live ! You're a proud mom, you deserve it! You have been missed. Welcome back. We received snow in North west Arkansas. It was just a few inches but under the snow is ALOT of ice. Totally jealous about the Qiviuk and can't wait to see what you make from it. We have missed you too. Your blog is one of my favorites. 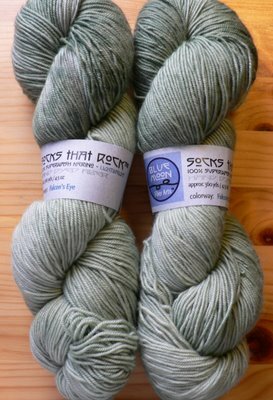 Can't wait to see what you make out of the muskox yarns! They looks soooo soft! I am glad you are back, too--I must have my Rovaniemi fix! You are the model of patience to listen to your husband talk about snowmobiles at such length. I do hope that when his fever cools down, you get an opportunity to talk at length about what you are making from the qiuvit. And I hope whatever you make, it is for you! Maybe you already have something knit from quiviut that is (almost) ready to be worn? I've missed you too, Lene! And I'm so envious of that gorgeous Alaskan qiviut yarn. I wonder what incredibly special project you will use it for? Qiviut, I am so jealous! Just to touch it would be so wonderful. I can't wait to see what you make of it. My husband and I had a 45 minute conversation the other day about combustion engines and what configuration of bore and stroke gives the best horsepower. I held my own (even though everything I know about those engines I learned in that conversation or gleaned from physics). At one point I stopped and asked him, "How come you never show this much interest in my knitting when I'm excited about it?" He stopped for a moment and then said, "Well, because knitting is BORING." I've missed you too. I am sure the dress is beautiful and the wearer will remember her dress, shawl and evening for many a year. Snowmobiles - can't compare with Quivik and Silk! I like your relaxed Christmas. I will only make ginger cookies for my mailman, paper boys, etc. Happy knitting in the glow of candles and needles! Wish I could see Snow Queen. And we have missed you! I don't believe you for a second that you haven't or can't talk about spinning wheels or yarn for two hours! :o) I struggle to keep the glaze out of my eyes when my husband starts talking about Auburn football. Your descriptions of days/nights and the mood of life north of the Arctic Circle make me want to move there!! Winter is my favorite season of the year and with global warming our winters have been getting warmer and warmer and the snow less and less. I would join your husband in his expedition to the Ocean on a snowmobile. But, I would be like ElizabethZimmerman, who knit while riding on the back of her husband's motorcycle! How blessed you are to have a large amount of qivuit to knit!!! And, with needles that give their own light. I started to dream about visiting Rovaniemi to see the ballet. We have missed you too! Can't wait to see what you knit with the Qiviuk and STR. I live in Illinois, (near Chicago, USA) and we had quite the snowfall last night. It's uncertain as to how much since it is still snowing but the news has estimated around 8-9 inches. We have a 4-wheel truck but a snowmobile would be much more fun! And I do empathize with you, when obsessed my husband can go on for hours too. Missed you too, and patience is a virtue,eh? I always enjoy your posts to the fullest...would love to see the dress and shawl, in due time? The Qiviuk...I've gotten to hold it in my hands and nearly wept from the softness, but alas, have not purchased any, am very much looking forward to seeing what you make with it and yes, I hope it will be for you. Something seems so very wrong with the love of man for a loud machine and desiring to roar out into the quiet of nature. I'm thankful that Ed and I are on the same path in that regards: he hates loud motors ripping through what was a serene setting. Tracing a barely discernable path meandering through the woods is far preferable to both of us. You have the right idea for enjoying this season. Welcome back! Though most of us live in such different places from your home, it is wonderful to read your descriptions of life there. You are such an inspiration. I check your page each day in hopes of a new installment. I also love winter and look forward to settling in by the fire early in the evenings...more time to knit! Enjoy your December; good for you not to put pressure on yourself! I too am taking it easy, with not a lot of Christmas knitting to do, and only one baby project for January. (actually two, a lacy sweater (in case of a girl) and a Baby Einstein jacket (in case of a boy)). We missed you too! It's nice to have you back and with such wonderful yarn to show too. I say, if your daughter is happy with the dress, then that is what counts. She'll likely out grow it quickly. I'm sure the dress is lovely, and the main thing is your daughter loves it. My husband is obsessed too, with model trains. He has a huge layout of large scale trains in our basement. Now he has discovered the fun of bidding for trains on ebay. I have to hear about every bid, and see every car he gets. And they all look the same to me. Qiviuk ! lucky bean!! I can't wait to see what your magic hands will breath into it. it seems it was only yesterday you talked about endless days, in June/july- and now- endless nights. very extreme. Missed you, worried about you, cared about you, sent warm thoughts northward. Luck to the little dancer in the snow. Make sure her footsteps do not dance her far far away into the realm of the wicked Queen for good! You have been missed. I often think about you and your version of winter. I suspect your hands will be very busy with your newfound fiber-love, and away from the keyboard...do enjoy! As we have missed you. The cold has chosen today to invade my home. Out come the warm sweaters and furry slippers. I'll be venturing out to my LYS tomorrow, so perhaps will fondle some Quivit. Yours looks so soft! Perfect to work with during your long evenings! And congratulations to your snowflake! Just like everyone else I missed you - glad to see the post pop up today. I bought a Qiviuk piece in Alaska when I was there (not a knitter at the time) now it has a bit of a break where a zipper caught i and I have been debating ripping it out and doing something with it myself. Do those needles actually glow? I love hearing about your lifestyle.....so different to mine in the UK. And yes, I am envious. It's wonderful to have you back. I've missed reading your blog, it's the first thing I check in the morning. Here in North Idaho (USA) we have 6+ inches of snow. Truly feels like the beginning of the Christmas season. I intend to enjoy this month much like you. Knitting, friends and simple holiday activities. Enjoy your month. So glad your daughters opening night went great. She must take after her Mom with her artistry. I've asked both my LYS's if they have Qiviuk and they shake their head at me as there isn't much call for it around here. One of these days I'll get to see it for real, but in the mean time you've provided me with the best picture. It's beautiful and the STR is as well. Do you have pictures of your daughter in the Snow Queen, or are photos prohibited? Snowmobiles are the devil's spawn. Noisy intrusive things. Where I live they seem to be ridden exclusively by noisy, drunken, rude and foolhardy people, i.e., testosterone-crazed males. Deliver me, please. Do you find that you like the light-up needles and that they work effectively for you? What lovely yarns - and I hope you will show us the dress, too? Dear Lene, And we have missed you. I'm happy to hear that all has gone well for your dancing daughter. I have those needles and bought them for knitting while riding in the car at night. Knitting is the only thing that makes long rides bearable. They are great and I discovered I only need to turn on the working needle's light. We lost power for 26 hours this weekend but I could knit and wasn't as miserable as I would have been.